WE ASKED, HOW CAN OUR SCHOOL BE MORE GREEN? 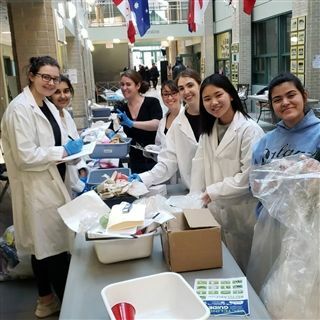 We had a very successful, and at some points disgusting, waste audit on Jan. 23/19 with the help of Dave Pancoe, a Junior School parent, who is the special projects manager at The Forks, where he took the lead in implementing a compost program. Our goal was to determine how much of our daily waste is compostable. Thanks to our amazing team from 4Kleen, all waste (including garbage and recycling) was collected from around the school as well as the boarding house for 24 hrs. and labelled by area (Boarding, Food Services, Dalton House, BH Beginnings, Middle & Senior School, etc). Student and employee volunteers sorted and weighed everything that was garbage, recycling, and compos. Interestingly, by volume based on visual inspection, the amount of compost was limited, recycling was moderate, and garbage was greatest. The majority of that garbage, by volume, was plastic in addition to paper towel, which is compostable! We were pleasantly surprised by how little overall waste 600+ people produce in a day. It was clear, though, and unsurprising, that the recycling bins are contaminated with garbage and compost. Indeed, it is well-known that most "recycling" ends up in landfills because the items are too contaminated to recycle. But there's still hope for us! Thank you to Ms Briggs, who compiled the data following our waste audit last week. Overall, 61% of our total waste (by weight) is compostable, which certainly validates our cause; numbers don't lie! It would be difficult to argue that composting at Balmoral Hall School would not offset costs and help our environment. We are excited to pursue a compost program this spring to reduce our carbon footprint, starting in the kitchen and dining hall, in partnership with Green Action Winnipeg's Commercial Compost Collection service through Compost Winnipeg.